Join IDDI at the Oncology Strategy Meeting. We would love to meet you at the Proventa Oncology Strategy Meeting and discuss your needs in your oncology clinical trials. As an oncology CRO led by a highly-skilled biostatistical and clinical team of thought-leaders in cancer research IDDI has the capabilities to ensure the successful execution of your clinical development program and help accelerate your clinical trial timelines! 66% of our studies are in cancer research. Gain efficiency in your oncology trials, contact us! IDDI is a therapy-focused data services CRO providing expert clinical trial services: Biostatistics and eClinical Services ensuring clinical data ready for submission. Catherine Indekeu, VP, Business Development will be there! Want to set up a meeting? Proventa Oncology Strategy Meeting lets you explore oncology trends that matter to you like biomarkers, cancer genomics, clinical trials and more with experienced industry professionals. 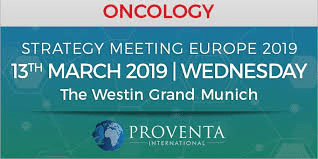 Proventa International’s unique format of Oncology Strategy Meeting Europe 2019 gathers seasoned local and global thought leaders in an exclusive discussion where director-level professionals share knowledge and insights on key strategic challenges in oncology clinical trials.